The cache is NOT located at the given co-ordinates. 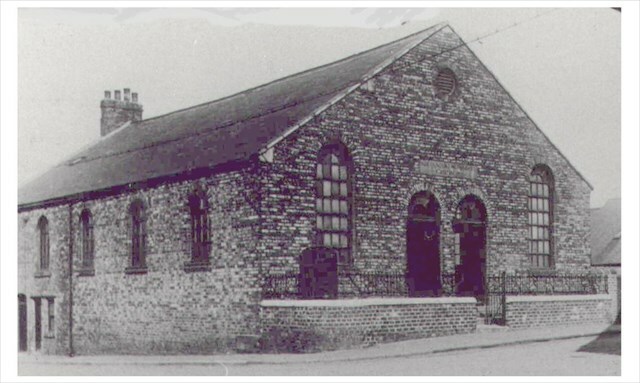 What was known as the 'Christ's Army' became associated with the Christian Lay Church movement (which originated in Sunderland, in 1877), and eventually joined the Sunderland Circuit of the Christian Lay Churches as a member Church, from which time it became known as Hetton-le-Hole Christian Lay Church. Initially using the Miners' Hall, in which to worship, the Christ's Army acquired land on the Avenue, directly opposite the Miners' Hall. The Christ's Army bought the land and as it continued as the Christian Lay Church so it continued to build that property in which to worship. The building work was started at the lower end of the street, which was then known as 'East Avenue', with the work commencing first on a schoolroom, then two cottages and finally the main chapel itself. It was not until 1889 that the 'Church' was opened, with a service of dedication on Saturday 31st August 1889 at 3.00pm. It is said that the male members, who were miners by profession, would leave the pit after their shift had finished and would commence work building the church. Their wive’s duly bringing their food to the building site. Over the years Hetton Church has been involved with many outreach events in the community and beyond. In 1968 our choirmaster, George Kirkbride, led the Northern Counties Confederation Choir at Newcastle City hall where Cliff Richard held a gospel concert. Many of our members were involved in this event which was televised by Tyne Tees Television. In 1969 the TV cameras were in the church itself filming “The Joybells” on the 27th April. The church today is still very much committed to reaching the people of Hetton with the message of Salvation.